So after my recent competition experience I dragged myself to see my physio who was shocked to see the state of my shoulders and neck and also my elbow tendinitis (Golfers elbow)which was certainly not improved by the rigours of shiai. The outcome of this was being told to not do any upper body training whatsoever for a few weeks which obviously included Judo. My neck and shoulders do feel a lot better but nothing seems to be making much difference to my golfers elbow condition. At the moment the inside of my elbow is sore to touch so the mere thought of intentionally smashing my arm in to the tatami to break my fall fills me with dread. Anyway I stumbled across this piece on the Judoforum today and thought I’d share it as using crash mats does seem like a very good idea, especially for those of us over a certain age. Please feel free to comment accordingly. 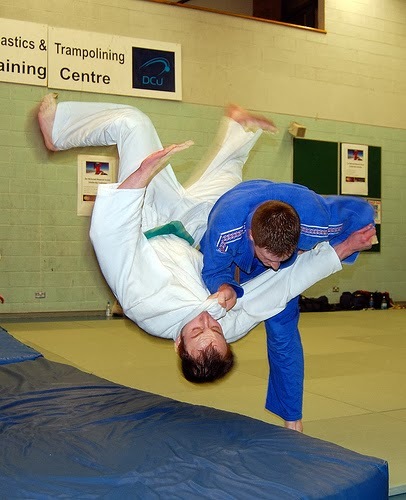 Crash pad training allows everyone on the mat to do more throws safely. Here are two important points. You can do more throws on a crash pad than throwing only on the mat (tatami). After a while, landing on the mat takes its toll on anyone-even tough guys who say otherwise. By using crash pads, everyone on the mat can perform a lot more throws-and the result is that the level of technical skill improves. An increased volume of throwing practice translates to an increased development of functional skill. 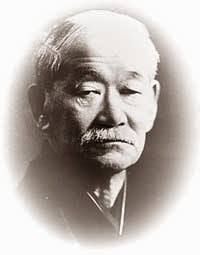 Anyone who says that power is not what judo is about simply doesn't know what the word power means. Power does not mean brute strength or lack of technical skill as critics contend. The ballistic effect generate by a throwing technique is tremendous and demonstrates the skill, movement and strength inherent in a good throwing technique. As far as safety is concerned, not only are there less injuries during practice when using crash pads, both in the short term and over the long haul of years of training, the body doesn't take as much punishment by landing on 8 inches of foam (in the crash pad) on top of the actual tatami than by landing only on the tatami. Sure, performing good breakfalls when taking a throw is important, but (as will be pointed out again later) the added level of safety in using crash pads definitely reduces injuries in practice. Anyone who uses crash pads can (and will) develop harder and more effective throws. The 8 inches of foam certainly helps cushion the fall for your partner when you drill him with that Uchi Mata, O Soto Gari or any other throw and it will provide the same cushion for you when he takes his turn to throw you. This means that you can develop more plyometric (explosive) power when throwing. I don't care what anyone says, the idea of a throw is to finish the fight. Throwing an opponent softly (in a match or real fight) is the antithesis of what the concept of Nage Waza (throwing Techniques) entails. A good analogy is boxing. Boxers use a punching bag to develop their punches in the same way judo, sambo, jujitsu and grappling athletes use a crash pad to develop their throws. Boxers don't train to hit an opponent softly, they train to hit an opponent hard. Crash pad training allows us to develop the full ballistic effect of a throwing technique. Some people will say that using Ukemi is sufficient and good breakfalls negate the usefulness of crash pads. Okay, learning how to land safely is a necessity-that is a fact. But anyone who has taken a lot of falls on the tatami quickly finds out that, even with perfect breakfalling skills, taking repeated throws from partners in practice takes its toll on even the toughest guys' bodies. After a while, people get gun-shy and avoid throwing practice or simply stop coming to practice and take up something more docile, like spending too much time watching Youtube videos of judo instead of actually showing up to practice. So, my point is that using crash pads adds another level of safety in training to Ukemi (this was mentioned earlier). Do not limit your throwing practice to the use of crash pads only. By all means, work on throwing techniques and skills when moving freely about the mat to improve timing, spatial awareness and other important factors in throwing. In the same way boxers do not exclusively use heavy punching bags to develop their punching skills, judo, sambo, jujitsu and other grapplers should not limit themselves to exclusively doing throwing practice on crash pads. Like any training tool, use crash pads in an overall plan of training and development.